Mobile agency Cymba work with big name brands and over 100 marketing agencies. We have managed successful text to win competitions for Coca-Cola, Eurostar, Heinz and Nurofen as well as on pack promotions for Newcastle Brown Ale, Carlsberg and Tuborg beer. 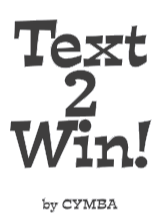 We look forward to providing your brand with the most effective Text to Win campaign available.